This past winter we had above average rain/snow falls here in California and this has created a wonderful bloom of wild flowers in the last few weeks, which are of course a photographer's heaven. 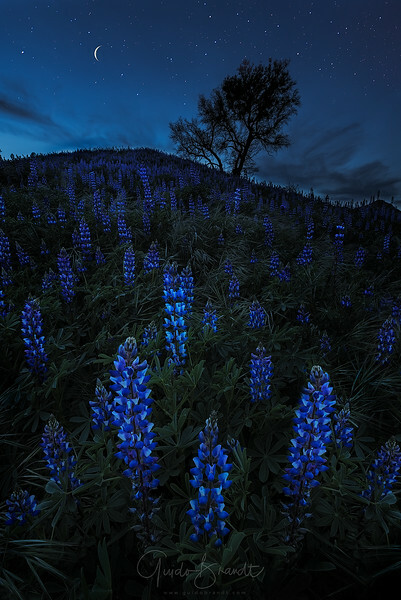 Two weeks ago, I caught up with my mate Matt and he was kind enough to show me 'his' local hill of lupines near Santa Clarita just north of Los Angeles. I left SoCal at 2pm to make it up the 60 miles trip on the Interstate 5 to this location in time for sunset. However, Friday afternoon LA traffic had other plans for me and I spent the next four (!) hours in a huge traffic jam!! When I finally arrived at the location 10 minutes after sunset, Matt was already up the hill and told me I had two options: directly up the hill or follow the trail........of course I was ready for the first option and started racing up the hill - until loaded with my backpack and tripod in my hand lost my balance and tumbled a few meters down the hill From then was covered in dirt and soot from the burned branches from last year's wildfires - great!! Nice to meet you Matt - yes I always look like this..... By now the good light was truly gone and so I could fire only off a few shots and be good with it......still a wonderful memory of this evening! 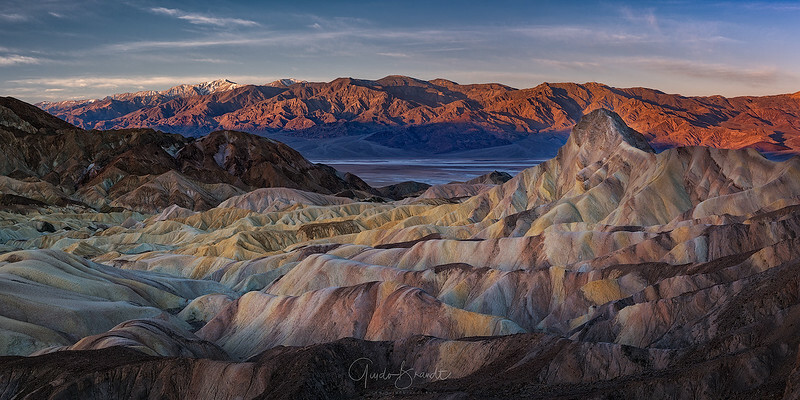 I have a bit of a love and hate relationship with Zabriskie Point in Death Valley National Park. 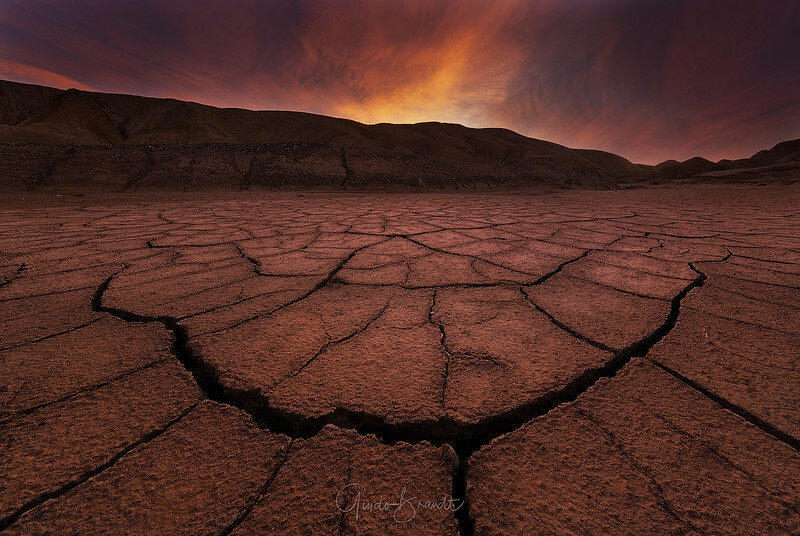 It is an easy accesible spot in the park, is suited for sunrise or sunset and is one of the stunning and striking geological features of the park - however I find it incredibly difficult to capture the beauty of this location and to represent the subtle textures correctly - without going overboard. I hope I managed with this image. When my wife and I arrived at the Jökulsárlón - Glacier Lagoon around 2am it was overcast with a slight drizzle of rain, not the picture book conditions I have seen on so many images. 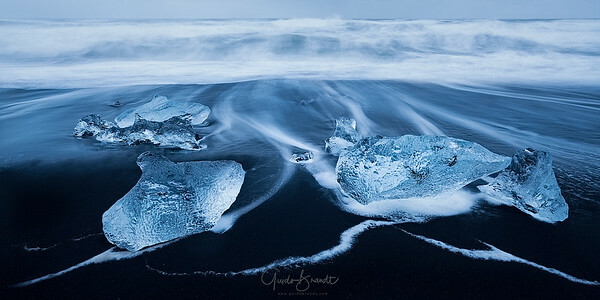 While my wife decided to get some sleep in the campervan, I donned by waders and rain jacket and started walking along the black sand beach in search for icebergs. I had to walk quite a while to finally found some. Nearby was a other photographer couple who were busy with doing some selfies with their cameras and tripods in the surf. Despite telling them to be wary of the waves and the then moving iceblocks they didn't really listen and for the photographer male it ended up with a snapped tripod leg - told you to be careful!! Otherwise it's a fantastic place to spent your time! Some 3 hours later I made it for some sleep in the campervan! During my first visit to Yosemite National Park I made several trips to Glacier Point as I was fascinated with the stunning view from there. I was lucky to be rewarded to a wonderful sunset shining beautiful light onto Half Dome and the mountain tops. 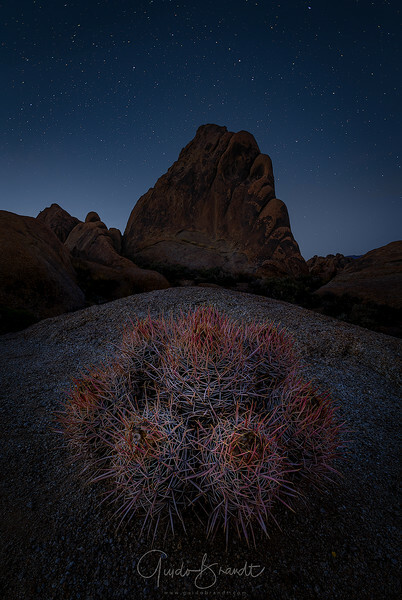 I took this image while camping in the Alabama Hills this spring. I had originally though this composition for some star trails, but the trails ended slightly offset to the main rock outcrop, so in the end I found this simpler composition more pleasing. 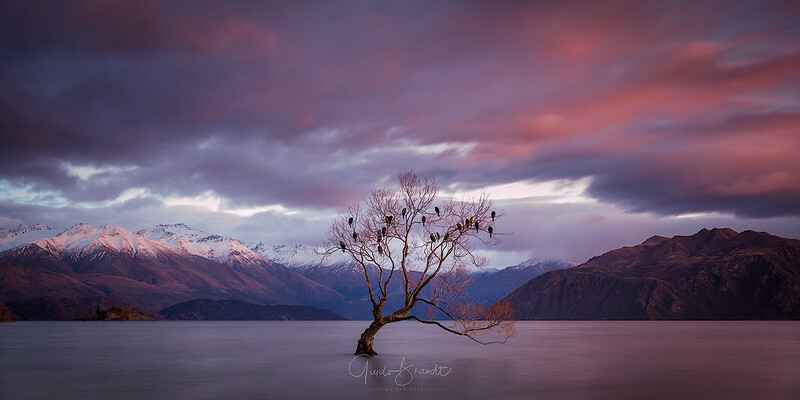 I took this image during a visit to NZ in 2014 of the 'famous' Wanaka tree. When I arrvied in the dark I only new the approximate location, so it took me a few 'test' shots to find it (the camera sees more than the eye). I cannot believe that at that time I was the only person there during sunrise. Nowadays there are hords of photographers making their pilgrimage to this location. 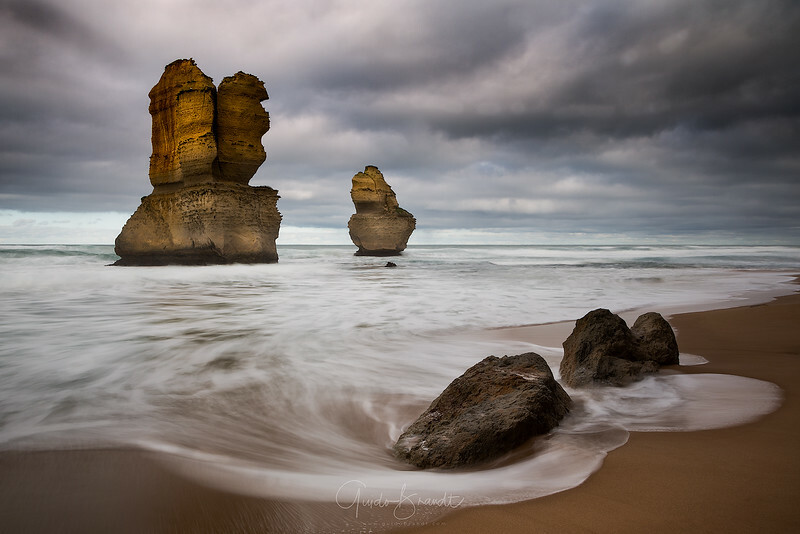 When, a couple of weeks back, I headed down the Great Ocean Road from Melbourne, I arrived at the Twelve Apostles in heavy rain showers at lunch time. Sitting in the car with rain belting on the windows I checked the weather forecast once again and there was nothing mentioned about rain. Even the rain radar didn't showed anything. I was getting a bit worried that my client and I had done the 4-hr trip for nothing and wouldn't get any great shots. I decided to proceed further westwards along the Great Ocean Road as the weather seemed to be clearing up that way. Thankfully the rain stopped pretty soon and we were getting great images at different spots. For sunset, we had planned to return to the Twelve Apostles and to my delight I discovered that a small waterfall had developed along the cliff face due to all the rain before. Cool!!! Now I was just anxious the weather would hold up until sunset and not cloud completely over as it does so often at this location. In fact, I had been there four times before with no reportable sunset image. 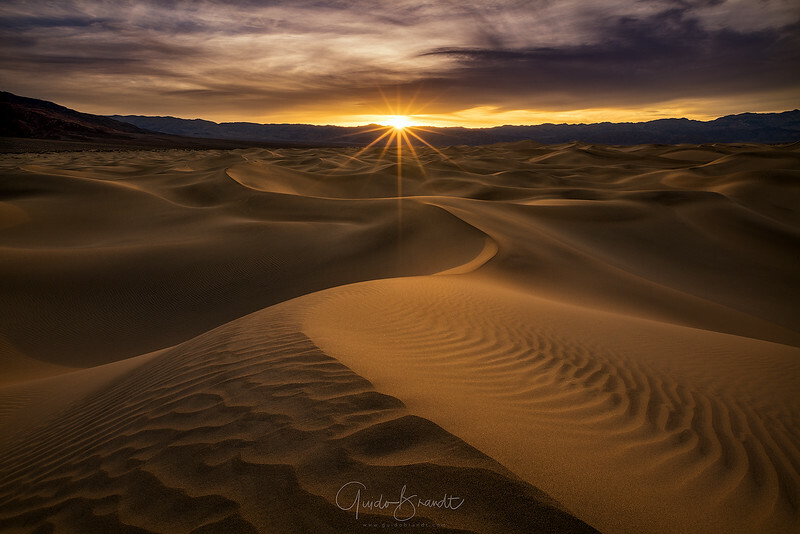 In the end, this fifth attempt was very rewarding - it was a sunset that will be ever etched in my memory. I had this image in my head for a long, long time. 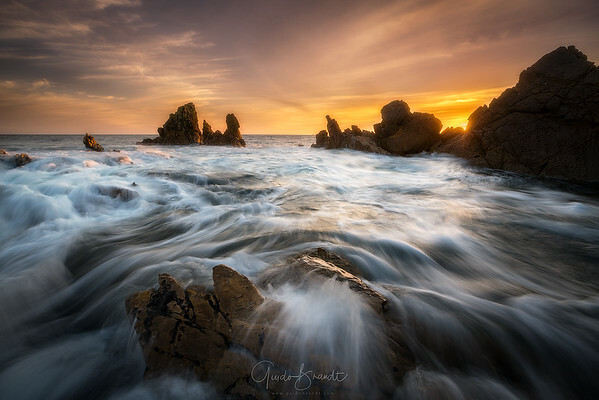 When I scouted various locations along the famous Great Ocean Road a few years back, I came across this lesser known location and I immediately realised its potential for a great panorama. Capturing the panorama in daylight I was somewhat satisfied, but I poundered about how I could I turn this into an extraordinary image - the solution was adding the Milky Way!! It is only during certain times of the year when the Milky Way is relatively low on the horizon - a couple of weeks back was such an opportunity. Now if you have been to the Great Ocean Road - and I have been numerous times - you know that it can be a windy, cold, cloudy and miserable place. Which is not good if you want to capture stars or the Milky Way with long exposure shots. After a couple of attempts I was finally lucky. I was at the Great Ocean Road for a private photography workshop and the conditions were for once great. I had worked out before that the Milky Way would the horizontal between 2-4am, so come 2am and I swung into full gear, drove to the location and I could not believe how clear and calm the night was. While I took this 12-image panorama, I witnessed around 30 meteors burning up in the sky. It was just a very magical - one that I have been waiting for a long time. 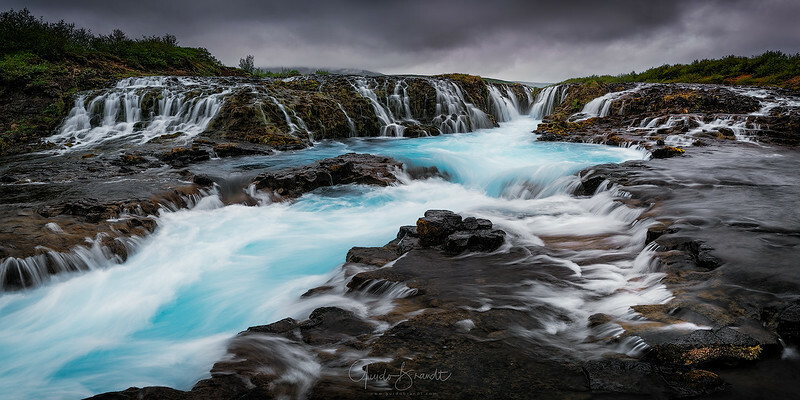 'Bruarfoss' My 3rd image from Iceland - this was taken at my 2nd most favorite waterfall on the island 'Bruarfoss', a small but very powerful waterfall that is hidden amongst bush and scrubland. It's actually funny to hear it from a while while you can't see it and you walk along this - in my case - at times muddy path to get to it. And all of a sudden there it is, which its powerful blue glacial flow. There is a bridge over it, which is a commonly used position to shoot from. 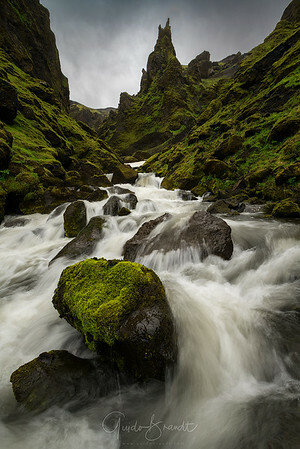 In the end I decided to go down to the waterfall level, hopped a couple of rocks and shot this 10-image vertical panorama (must have used a lot of overlap!!). 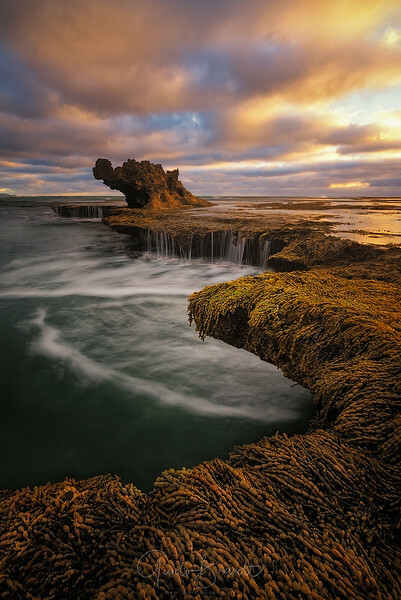 It's quite funny that i have seen several images of Dragon Head Rock in Rye on the Mornington Peninsula, Melbourne Australia, but for some reason I never ventured down there to see it myself. When I was in the area between Xmas and New Year, I decided to check it out. The first time, I got mixed up with the tides: I couldn't access it and wondered if that rock out there amongst the wild ocean waves was 'it'. The second time I was luckier and I not only got the right tide conditions during sunset, but also really nice light. Combined this with a colorful foreground and a bit of ocean swirl, it makes a pretty nice scene in my opinion. 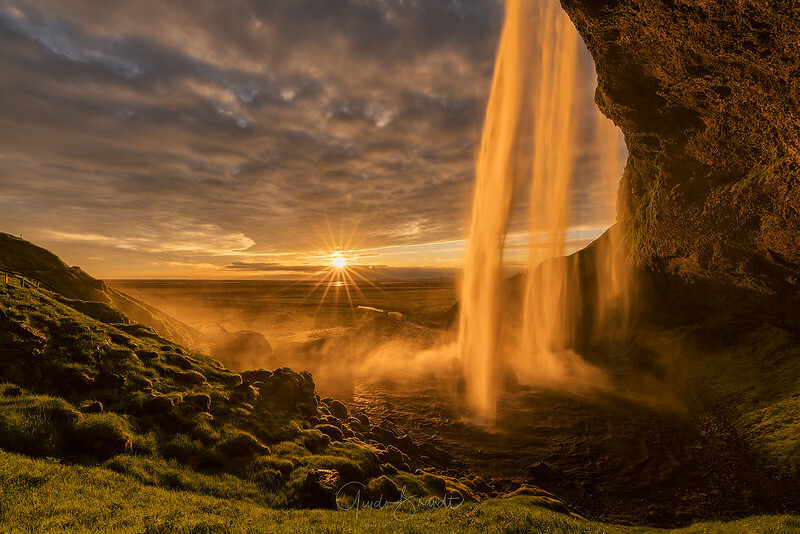 My only sunset image with a sun in the frame during my first visit to Iceland in 2016. Camping within walking distance to this waterfall was a special experience. One of my favorite places to roam around at midnight! When I visited the Vik area on my first trip to Iceland this June, I was pretty disappointed about the windy and rainy weather conditions that prevented me from taking classical scenes such as the Vik church amongst the blooming Lupine fields. Also Dyrhólaey lighthouse and coast and Reynisfjara beach were a complete wipeout. Based on the recommendation at the Tourist info, we decided to stay for the night on a campsite just outside of Vik – it turned out that this campsite was a 45min drive through glacial plains into the mountains to an area called Pakgil. After heavy rainfalls throughout the night, it finally briefly stopped in the morning and allowed us for a short stroll. I came across this little river and shot this image handheld. I researched the area a little bit later on and it would have been awesome to do more hiking there – that’s for next time. I finally got around to sort through the huge backlog of images I have yet to process and have now a better plan to regularly post more of my new images. I will also reprocess the odd one of my older images as I always try to improve my processing techniques. This all happens while I am discovering new places in the SW of the US and let me tell you that there are a lot of places to discover!!! I get a lot of inspiration and help from other local photographers that I follow, and then when I explore these new places I try instill my own take on it. 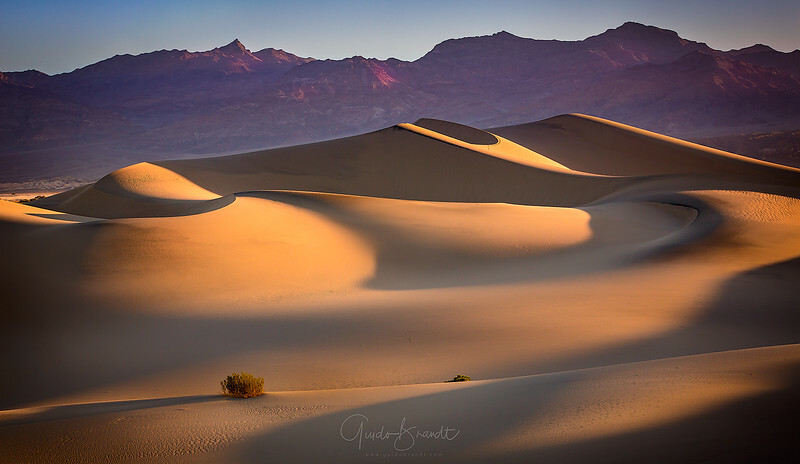 So in this example I saw this scene first in an image by Michael Bandy, please check out his awesome portfolio on Facebook or on 500px. This was the 2nd time I went to this small cove called Little Conora Beach and it is a great place that changes a lot with the tides. A great sunset was forecast by Skyfire as part of The Photographer's Ephemeris app, so I dashed to the spot to make it in time. Unfortunately the tide was still quite high, so I had to stand almost hip deep in the water to get this composition - but the water was warm and it was all good fun - next time I won't forget the waders though lol! 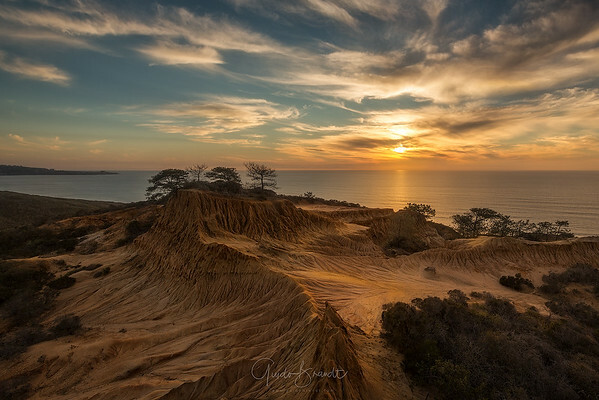 This was my first visit to this overlook near the Torrey Pines golf course in San Diego. I was just there to scout the area a bit and was not really intending to stay for sunset as the forecast was kind of average. I had visited a friend before and left too late, so I didn't have much time for scouting around, but I set up my tripod at this spot and was delighted when the soft light at sunset produced a nice glow on these sandy badlands. I hope I can go back there soon to finish my scouting. This image hopefully does justice of showing the raging fight of Pele, the Hawaiian goddess of fire, lightning, wind and volcanoes with her sister Nāmaka O Kaha'i, the sea goddess. I really wanted to depict the wild nature spectacle that is happening there right at the ocean entry with lava pouring into the raging seas, creating heaps of smoke plumes containing nasty hydrochloric acid. Being on the Big Island and seeing Pele is very special to me - I feel immediately at home there and can't wait to be back. 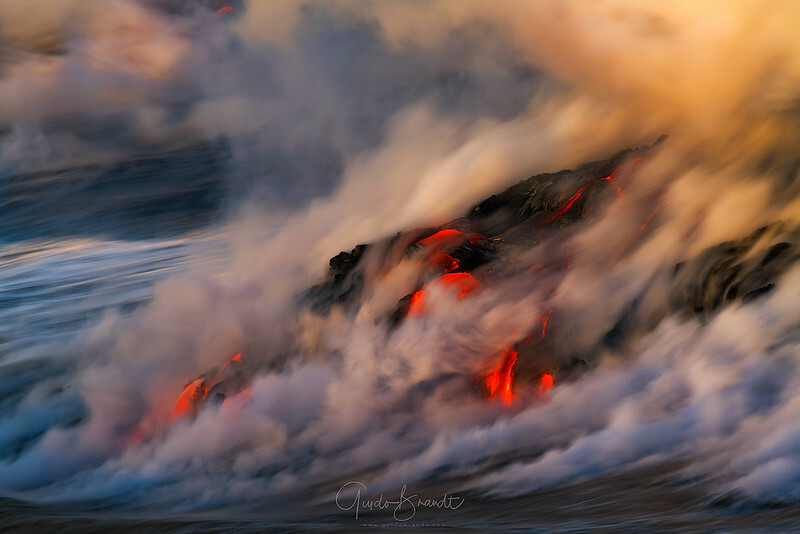 It was a fabulous night and sunrise out there with Nick Selway at the Kalapana Lava flow 61g. Thanks for watching. 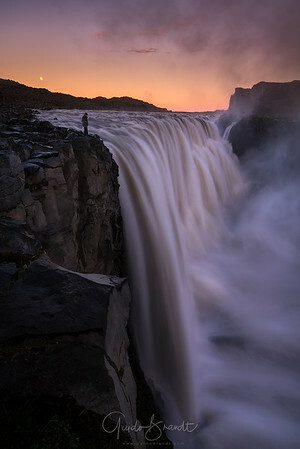 A selfie during the midnight sunset at Dettifoss waterfall. 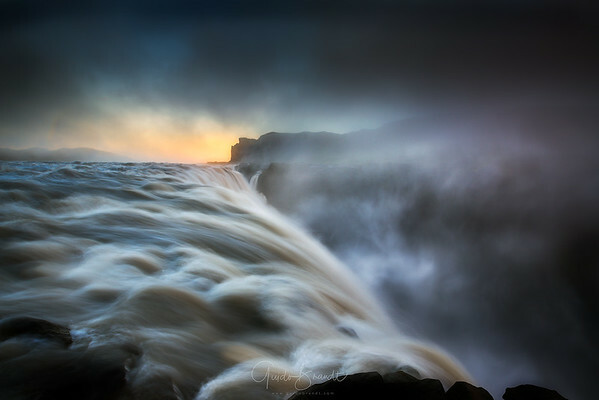 Unfortunately this moment didn't last very long as fog came rolling up the waterfall from further downstream. I enjoyed it very much though. 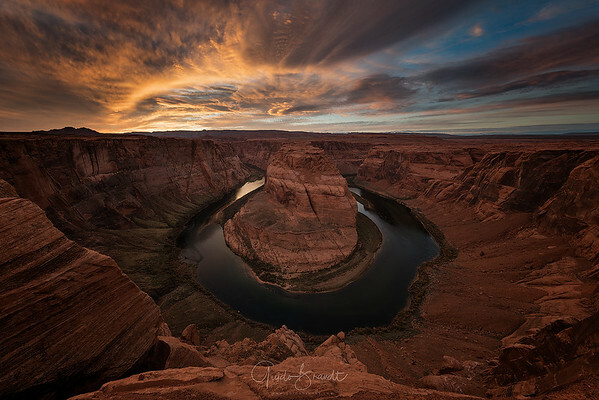 During my visit to the Grand Canyon National Park last Thanksgiving, I did a day trip to shoot some slot canyons near Page and on my return journey I decided to stop by at Horseshoe Bend for the first time and to shoot sunset there. During this holiday period the location of course was like a zoo! I have usually no issues of standing close to the cliff edge, but with hundreds of people around I was really worried that someone with a selfie-stick would accidentally bump me of the edge. So while I placed my tripod literally inches away from the edge, myself I stood quite 2+feet away and used the remote shutter cable to take the images. This is taken with an ultrawide angle lens to allow me to capture the whole scene! This composition is of course pretty standard for this location, but the sunset turned out to be quite cool!!! A few weeks back I was able to capture this glorious sunset at Little Corona Del Mar Beach at almost high tide. I love to dodge the waves with my tripod and my camera. I hope you like it! 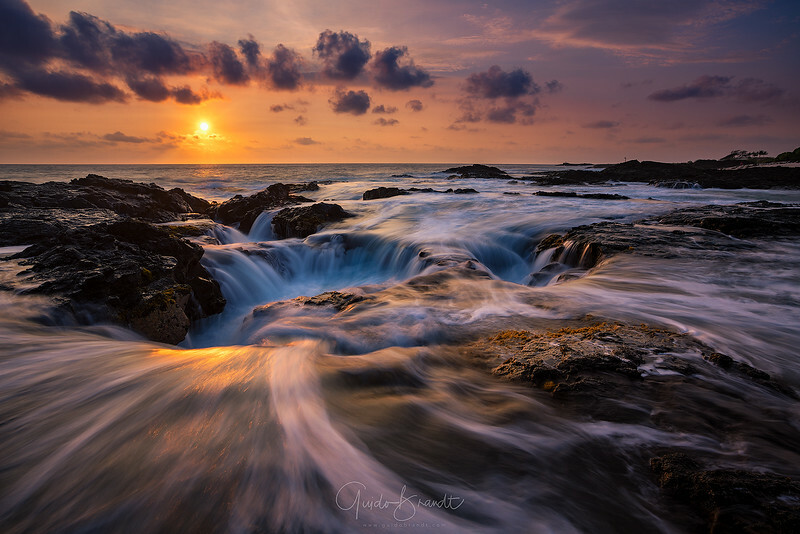 A fabulous sunset shoot at this location near Kona with the sun setting into the pacific. The tide was quite high, so it didn't allow me to venture closer to these old collapsed lava tubes. The ocean waves rush into them with an insane amount rushing back into the tubes creating a strong current - at times I was was well above my knees into the water and was holding tight on to my Really-Right-Stuff tripod. I hope you like it! 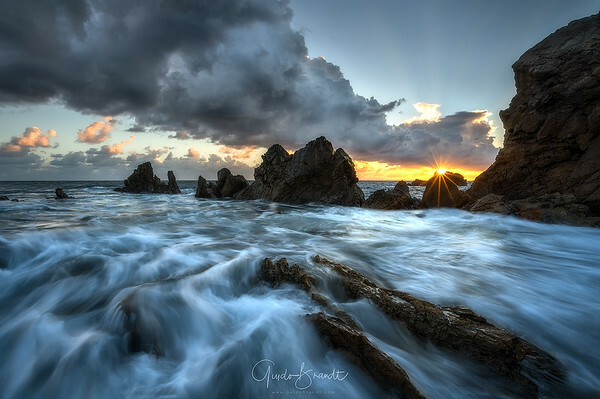 A few weeks back I was able to capture this glorious sunset at Little Corona Del Mar Beach at almost high tide. I love to dodge the waves with my tripod and my camera.